Are you ready to pop the question? Before you get caught up in the excitement of planning the perfect proposal, it’s important to think about how much you want to spend on the engagement ring. According to The Knot, the average cost of an engagement ring was $6,163 in 2016, which is 3% higher than it was the year before. 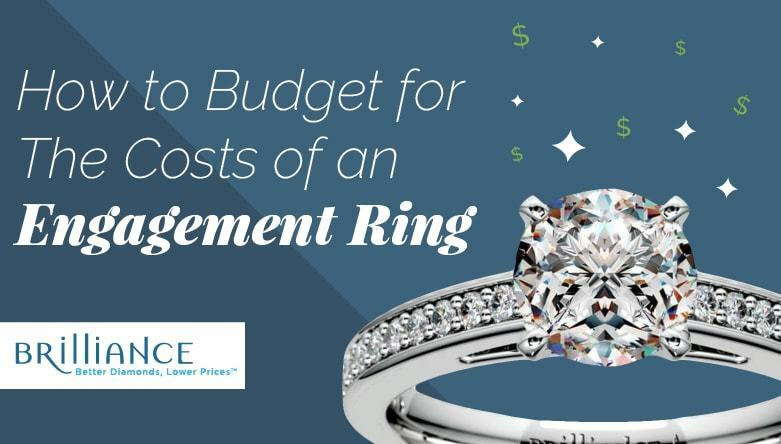 Since engagement ring costs are on the rise, it’s best to create a budget ahead of time so you know exactly how much you can afford to spend. There are several “rules” that couples can choose to follow when it comes to budgeting for an engagement ring. One of these guidelines states that the person buying the ring should set a budget based on his salary. Some experts recommend spending one month’s salary on the ring, while others believe three months’ salary is more appropriate. But remember, these are just suggested guidelines, so there’s no reason to feel pressure to spend one to three months’ salary on an engagement ring. It’s best to think about your current financial situation when determining a budget instead of worrying about these guidelines. No single budget is right for every couple! Learning about precious metals is important when budgeting for an engagement ring. The vast majority of engagement rings are made from gold or platinum. Both of these metals are durable, valuable, and fairly resistant to scratches and regular wear and tear. Platinum is more expensive than gold since it is slightly more durable and rare. If you’re trying to trim your budget, consider choosing a ring made out of white gold instead of platinum. The difference in durability is not significant, and because white gold looks nearly identical to platinum, it’s the best choice for buyers on a budget. Lesser-known metals such as palladium can also help you achieve the platinum-look on a budget. Palladium is a white metal that is durable and hypoallergenic, just like platinum. However, it is not as dense as platinum, which is why it is less expensive, and it is slightly darker in color. Diamonds can vary in price based on a number of factors, including their cut, color, clarity, and carat. Learning about each of these factors and how they affect the price of the diamond is important when setting a budget. The carat, which is the weight of the diamond, plays a major role in determining the price of the ring. Obviously, a 4-carat diamond will be more expensive than a 1-carat diamond. But, there can be a huge difference in price between two diamonds of slightly different sizes. For example, a 1.1 and 1.2 carat diamond look practically identical because the difference in size is so small, however there can be a big difference in price between the two sizes. In this case, it would be best to get the 1.1-carat diamond to save money. The color of a diamond can also impact its price. Most diamonds sold by retailers are between a G and J on the color scale, which means they are “near colorless.” Going higher than a G on the color scale will lead to a significant increase in price, but the diamond may not look noticeably different. Going lower than a J on the color scale would lead to a drastic decline in the price, but it would also affect the diamond’s appearance. Stick within the G-J range for a near colorless, yet reasonably priced diamond. Each diamond will also have a clarity grade, which is assigned based on the number of internal and external flaws the diamond has. The clarity of the diamond can affect the diamond’s overall appearance, so buying a diamond with a good clarity grade should be a priority. But, a diamond doesn’t have to have a flawless clarity grade in order to be beautiful. Diamonds with a VVS1, VVS2, VS1, and VS2 are far more affordable than a flawless diamond, and the imperfections they have are not visible to the naked eye. Some diamond cuts hide imperfections better than others, though. For this reason, it’s important to examine the diamond closely to ensure there are no visible imperfections before making a purchase. The cut of the diamond affects the way that it sparkles and shines when the light hits it. A diamond with a high quality cut will have an intense sparkle under the light, while a diamond with a poor cut will not. However, some shapes, such as round-cut diamonds, sparkle more than others, such as emerald-cut diamonds, regardless of the quality of the cut. Scaling back slightly on the size of the diamond can drastically reduce the price without affecting the ring’s appearance. Don’t make the mistake of assuming that you have to choose a diamond with the top color and clarity grades. Diamonds with mid-level color and clarity grades are just as beautiful and far more affordable. Focus more on the diamond’s color, cut, and clarity than on its carat. Bigger is not always better. Many retailers offer financing plans to make it easier for customers to purchase engagement rings. Brilliance customers have the option of applying for financing through Affirm as they check out on the website. After entering in their basic information, customers can see whether or not they qualify for a loan to make the purchase. If the loan is approved, customers can pick a plan that works best with their budget. For example, let’s say you enter your information and find out that you qualify for a loan of $850 using Brilliance’s online system. At this point, you receive three different payment plans to choose from. You can choose to make larger payments over a 3-month period, medium-sized payments over a 6-month period, or small-sized payments over a 12-month period. After selecting the best plan for your budget, finish the rest of the checkout process using the money from the loan. This type of payment plan makes buying an engagement ring affordable. Instead of having to pay hundreds or thousands of dollars all at once, customers can gradually pay off the ring after the proposal! Buying an engagement ring is a big financial commitment, so take your time when coming up with a budget. The average engagement ring costs may be increasing, but there are still beautiful rings within every price range. Your proposal should be stress-free. Figure out how much you can afford and then start searching for the perfect ring within your budget!